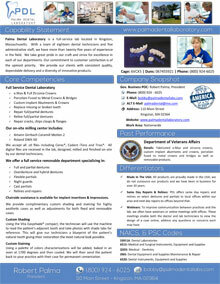 Click here to Submit a Case to Palma Dental Labs. Proudly serving the dental community with optimal clinical value through high quality restorations and committed service for over 30 years. Leave the Stone Age behind!!!!! Our partnership with 3Shape, the acknowledged global leader in 3D scanners, allows us to offer a full range of restorative materials and products anatomical crowns& bridges, substructers, implant abutments & bars, models and p.d. frames. These choices are made possible due to 3Shape's open architecture format which allows us to pick and choose the best materials and CAM facilites without the restrictions and limitations of a proprietary format. Imagine simultaneously manufacturing (CADCAM) both model and restoration. This is achieved by creating a highly accurate digital model from a physical impression through adaptive impression scanning. Within minutes we are designing the restoration from a 3D virtual model. The impression scan and design files are then sent to the CAM facility of choice for fabrication and return delivery. Gone are the ever changing variables inherent with the traditional fabrication process from stone models. Through digital CAD-CAM fabrication, accuracy and consistency are a constant. We invite you to experience the digital revolution. Learn more about our Digital Impressions here.